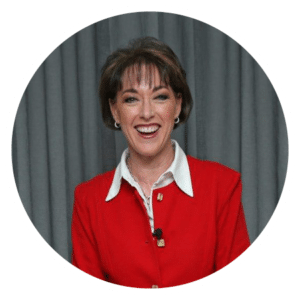 Your 4 – 6 year old child is now in preschool and school readiness skills are being developed in earnest now. Colour, shape and quantity become an important feature in many preschool activities and should be reinforced at home with some good perceptual games which are always far more enjoyable when played with you. Children start colouring, drawing, threading and building with a purpose and can have very vivid imaginations – encourage them! First board games provide loads of fun and create an opportunity to learn how to take turns, and share. Keep talking together and engage in all their ‘why’ questions as they discover out how the world works. Encourage fantasy play and creative pursuits that involve playdough, paint, water and even mud! You child’s time spent on a device needs to be balanced with real-world play activities that create 3-dimensional, sensory understanding of the world. Your encouragement and participation in the play experience will help to keep them focused and engaged for longer and longer periods. Keep in mind that when they get to Grade R and Grade 1 they will need to pay attention for approximately 20 minutes at a time. Play generates a love of learning which is vitally important. 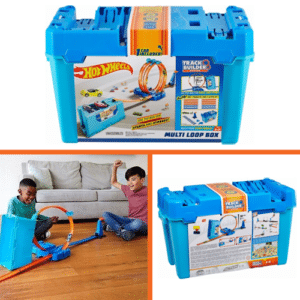 We love well-packaged toys that can be stored easily and this one utilises the box in the construction of the stunt track. It’s the ultimate portable storage and stunting solution with 10ft of track. How clever is that? Countless track variations to be built, problem solving and challenges for kids to experiment with. Comes with one car, connectors, launcher and two scoring buckets built in, with plenty of places to connect the track. Can be interconnected with other Hot Wheels tracks. This is a lovely first matching dice and board game. 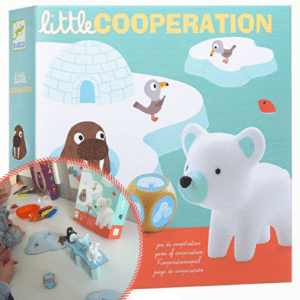 The team must throw the dice to move the four cute arctic creatures from the fishing hole to the igloo, across the ice bridge before it collapses. The picture dice provides instructions on what to do: the bridge symbol tells you to place an animal on the bridge, the igloo symbol tells you to move an animal from the bridge to the igloo and the ice block symbol tells you to remove one of the ice pillars supporting the bridge (Jenga-style). It’s a team race to get all the animals across the bridge before it collapses, creating an element of suspense. 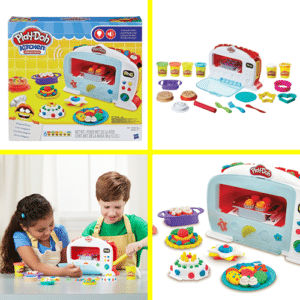 Bake with Play-Doh in a Magical Oven that makes baking creations rise just like in a real oven! The Magical Oven features real lights and sounds. Simply put some Play-Doh compound into one of the five pretend food attachments eg, croissants. Place it in the oven, then press the lever and see the Play-Doh food rise in the oven like magic! The oven lights change from red to white and there is a timer. Comes with lots of built in molds to customise baking creations and a creation card to help inspire your junior chef. Playing with playdough is a sensory activity combined with creative play. Stimulation through the sense of touch – pushing, rolling, squeezing, pulling – are all things that children cannot yet experience on a phone or tablet screen. 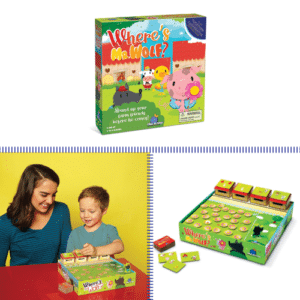 In this cooperative memory game, everyone works together to help all the farm animals get back to their barns before Mr. Wolf arrives…but where is he? This game is all about visual memory. Which cute animal tokens have you already found and posted into their 3D barns? Which ones do you still need to find? Work together as a team to beat Mr Wolf. For younger children use fewer animal tokens to make the game easier. The animal tokens can also be used for a traditional memory game of finding matching pairs too. Lemonade for sale! 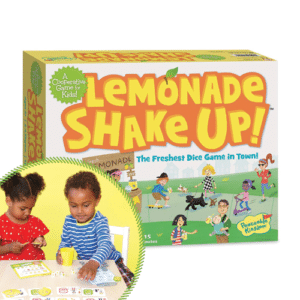 Work as a team to make and sell enough cups of lemonade to fill your money jar by shaking the five picture dice on each player’s turn. Different combinations of dice determine the ingredients of your lemonade. Miss the recipe match and you get a sour lemon for the team instead. Race to fill your jar with money before you get four sour lemons, and the team wins. Children learn to co-operate, follow rules, win and lose. 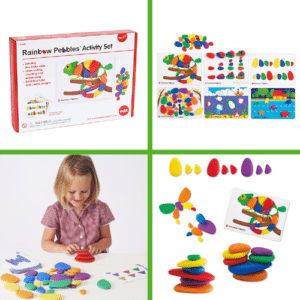 The Rainbow Pebbles Activity set is a school readiness set in a box. It is ideal for developing fine motor skills as well as encouraging and strengthening counting, sorting, sequencing and creative design. Use these 36 brightly coloured pebbles, that are beautifully weighted, to complete the 24 challenges on the cards from building flat in 2D to building towers and pyramids in 3D. The pebbles are uneven making building a challenge. Stimulates matching and copying skills, spatial planning and problem solving, counting and colour sorting, and much more. The Eggventure Game is all about collecting and making matches while moving around the game board. Collect the egg tokens that match the five cards you have been dealt by strategically visiting different parts of the board which then allow you to turn over the various Hatchimals on the board. 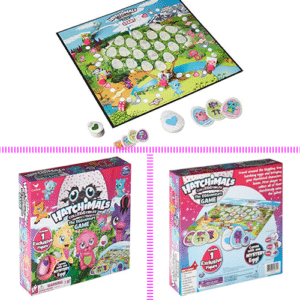 This is a memory game – if the Hatchimal is not a match for another player it may be a match for you – but you have to remember where they are hidden on the game board! The game comes with 4 totally exclusive mini Hatchimals Colleggtibles in mystery eggs. 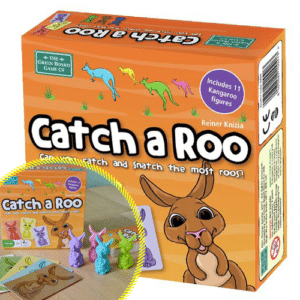 This is a fast-paced, strategic card game that comes with a deck of coloured kangaroo cards and cute little plastic kangaroos. Play coloured kangaroo cards to catch a new kangaroo or defend one you have already won. The last player to play a matching colour cards wins the kangaroo. You can also play snap and rummy with this deck of cards. It comes in a small, sturdy box and is ideal to pack when going on holiday or to take to a restaurant. This double-barrel blaster allows kids to launch two high density foam cars at the same time. Set up targets, ramps, and obstacles and send cars flying through the air. Challenge friends to see who can take on the ultimate obstacle, whose car will soar the highest, or go the farthest. 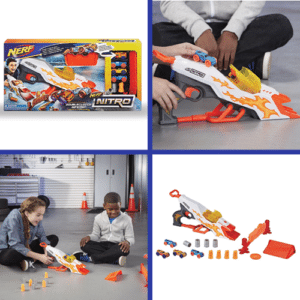 This stunt kit includes the blaster, four NERF NITRO foam cars with plastic wheels, double ramp, eight obstacles, double pop-up target and instructions. A colour matching memory game. Each of the 6 frogs has a different coloured base, and there are 20 water lily cards that are placed face down on on the table. The frogs are placed onto the stones in the lily pond. Turn over a water lily and then pick up a frog and see if the base is the same colour. If it is you win the water lily card. If not, turn it over and move the frog to a new stone in the pond. This means that the ‘game board’ is always changing increasing the challenge. For younger players don’t move the frogs around, or play with fewer water lilies. 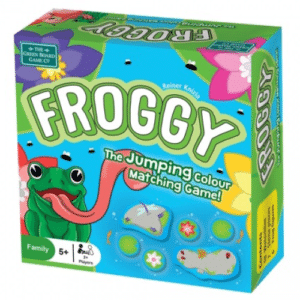 This game comes in a small, sturdy box and is ideal to pack when going on holiday or to take to a restaurant. Keeping the magic and mystery of Christmas alive for little children is becoming a real challenge in our commercialised world. 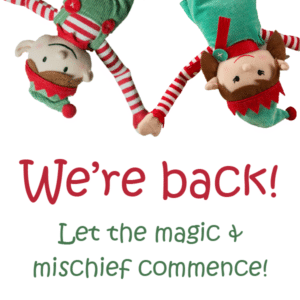 Along comes the award winning Elf for Christmas from the UK to help you do just that. What we love about this range of products is the super sense of humour that is built into all the different elements that are so very child-friendly. Stunning design and attention to detail. Your family will be left tingling with excitement and anticipation for the arrival of Christmas and Santa Claus this December.